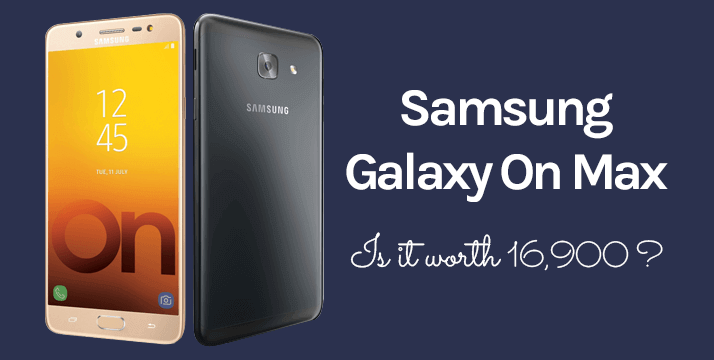 Samsung Galaxy On Max Review - Is It Worth 16,900? Samsung Galaxy On Max Review – Is It Worth 16,900? Samsung Galaxy On Max is a brand new mid-range Android smartphone which is available for 16,900 rupees in India. One thing which you guys must know is that Galaxy J7 Max is the actual name of this device. But just because it is going to be launchFlipkart exclusively, it has got a new name. It is a photography centric smartphone which is being sold exclusively on Flipkart. Till now there has been no statement by the company on whether it will be sold at other online retailers like Amazon or Snapdeal. According to the official reports, the company has no plan to sell it offline. If you are planning to buy this mobile, then I will suggest you first to read this detailed review. Below I have discussed the specifications of this great, mid-budget Android mobile. This review is divided into various helpful sections. If you have got more latest news or updates regarding it, then please don’t forget to share it with us and our community. Scroll down and read on. It comes with a 5.7 inches full high definition TFT screen. It has a resolution of 1980 X 1080, and the pixel density is 401PPI. The display is quite bright and watching multimedia contents, and playing games are quite enjoyable. I think for the first time Samsung is providing such a high configuration in their mid-range smartphone. It comes with an MTK P25 premium performance octa-core processor. The processing speed offered by this processor is close to 2.39Ghz when clocked. The base clock speed is 1.6GHz. Furthermore, to give you better, enhanced user experience while playing games or multitasking, it comes equipped with 4GB ram. One of the most noticeable features is 13MP primary and secondary camera. Yes, you read it right. As it is a photography and multimedia centric phone, Samsung has tried to push in all sorts of possible features. Both front and the rear camera is assisted with LED flashlight so that you can take beautiful pictures even in low light environment. The front sensor comes with an exclusive mode called “Social Media Mode.” When this mode is activated, you can click selfies and then apply various social media focused filters and modifications. It even has got stickers. Once you are done with editing your pictures, you can share them instantly on different social networking websites.One another noticeable feature is that now you can pin your contacts directly within your phone and then share your pictures with them. It has got a decent battery with total cell capacity of 3300mAh. Although the company says that its enough power to keep you going for a whole day, but I really doubt it. I mean even if you are getting 300mAh extra power, but then you also have a 5.7-inch screen, 4GB ram and variously integrated app which you just cannot remove. Since I am an avid gamer, I think with 100% charge this phone will be able to handle my activities for maximum 8 to 12 hours. Currently, this smartphone will be available in two different color variants. First one is gold and second one is black. If you consider my suggestion, then I will suggest you to go with Gold color as it gives this smartphone more premium look. The body is made up of metal and follows uni-body design approach. It gives Samsung Galaxy on max a smooth and slim body, but it also means that you cannot remove the battery. So in case your phone froze or hangs then the option to remove the battery will not be available to you. It has got a width of 78.7 mm and height of 156.6 mm. Depth is just 8.1 mm which means it’s pretty slim. Considering its size, I think the weight of 178 g is not bad. Galaxy On Max comes with Android Nougat OS. As far as connectivity is concerned, it comes with 4G LTE support on both sim slots. Furthermore, it supports various 3G bands. In order to offer you an enhanced security, it comes with a powerful yet super responsive fingerprint scanner. The placement of the scanner makes it super easy to use. It is a powerful yet easy way to do online transactions safely and securely. With the help of Unified Payments Interface system now you can pay to anyone online without entering the bank account details. Just scan the QR code and then proceed to the payment page. Enter the amount, recipient name and optionally add the notes and then proceed to the confirmation page. Once you confirm all the details, you need to click on the next button and done. Money is sent to the recipient securely. © Copyright 2018 GadgetRaja ® All Rights Reserved.